Land Rover SUVs are known for their luxury and their advanced technologies. But they are also luxurious family vehicles and what does a great family vehicle need? Towing capabilities! 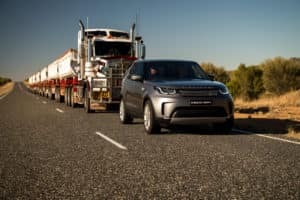 This video shows off the ultimate towing test – towing a road train across the Australian outback. The best part is that the Discovery can tow up to 8200 pounds which means hauling a boat or a trailer is no problem! Here at Land Rover Colorado Springs we have a super inventory of the 2017 Land Rover Discovery in stock. Stop in today to check them out and even take a test drive! Our Land Rover experts would love to tell you more about the super towing capability of the entire Land Rover lineup. Of course, we can also introduce you to the many other exciting features you will enjoy on your 2017 Land Rover Discovery.